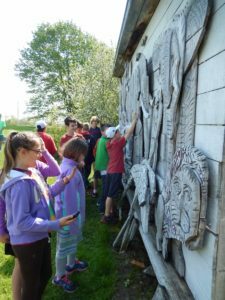 In the spirit of renowned local artist Bernard Langlais, children will be natural artists and explorers while enjoying the glorious setting of the 90-acre Langlais Sculpture Preserve. Scholarships Available: email cynthia@grlt.org or phone GRLT at 594-5166 for scholarship application. You can register here – Langlais Camp Registration or by calling GRLT at 594-5166. You may pay online below, or also by phoning the GRLT office.